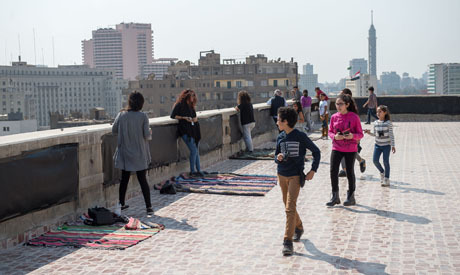 Set on the rooftop of Al-Jameel Center, within the Greek Campus of the American University in Cairo, Lookout in an interactive performance that invites spectators to look at downtown Cairo from above, while imagining the future of our old city through the eyes of Egyptian children. The piece is programmed within the theatre section of the Downtown Contemporary Arts Festival (D-CAF) and performed over several days in March and April. The production is directed by Andy Field with a music-and-sound design by Tom Parkinson and dramaturgy by Sibylle Peters. The work is a collaboration with 16 Egyptian children recruited by Misr Language School and Bedaya Charity Organization in Cairo's Manshiet Nasser neighborhood. Lookout is an interactive piece involving the participation and contribution of the spectator – and taking participation to an extreme. Not only does the setting challenge expectations, but the performers also excel in breaking stereotypes relating to performance. 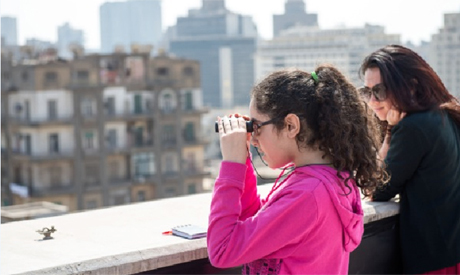 On entering the performance space, we discover that the "stage" and scenography are merely the view of downtown Cairo. We are confronted with the city as a performative element and an esthetic component of a performance. It suddenly becomes clear that the title, Lookout, corresponds to the action of the spectators who are a vital part of the equation that creates the performance. Andy explains the process: each spectator will get a little speaker that eventually plays a monologue of the imagined future of the city; each spectator has a specific position in which to stand and look out on the city; hence, the perspective of each spectator is already decided by Andy, probably in relation to the content of the monologue. At the start, the spectators gather around Andy to receive their instructions and get their speakers; they are then quickly dispersed along the line of the rooftop. The spectators create a striking image: a line of viewers standing in unison, doing the same action, looking out together and imagining. As interactive as it gets, Lookout smoothly throws the ball into the spectator's playground, saying: "You are here to play with us, to create the piece with us, to contribute with your own vision of what you confront, and to fuse the physical reality of downtown Cairo with the imaginary future," spoken to you through the words of an unknown child's voice. Gradually that singular child's voice takes physical shape and the child/performer appears by your side. 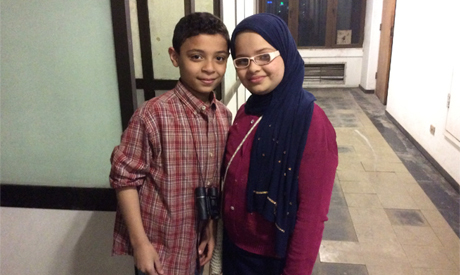 I was blessed by the company of an excellent eleven-year-old performer: Mariam. When I was about to go astray with the wild fantasies that she was voicing (through the speaker) about cars flying in the air to solve the chronic and tragic traffic crisis of Cairo, about helicopters contributing to the imaginary sky-scape, and beauty fluctuating in the air, Mariam appeared to ask me questions and confirm that my contribution was shaping my own reception/perception, that I – as a singular spectator – had my own singular performance that does not necessarily coincide with my fellow spectators. She asked and I answered. We shared memories and secrets. It was a genuine conversation made with unique freshness. Unlike many interactive performances, Lookout succeeds in making you feel special. Although the whole event is pre-designed, the young performers manage to insinuate an authentic experience every time they interact with the spectators. Lookout breaks the traditional stereotype of the child performer as almost a pet. A child performer here is not just the beautiful, docile and pleasant little creature, but rather a responsible professional who has the responsibility of leading the whole performance and of guiding each spectator on a unique journey where both – the performer and the spectator – stand on equal ground and exchange intimate visions of their lives in relation to the geography of the city and to the personal memories of their respective dwellings. After Mariam left me alone and disappeared, and as I realized that her "performance" had had a very personal impact on me that transcended the traditional barriers of entertainment and imagination, I heard the remains of the sound-track voiced via the mini-speaker. The rest of the children were saying bits and pieces of their monologues. The little pieces intersected, creating one monologue of interwoven visions and imagination. The presence of some phrases in English meant that the child who speaks those phrases belonged to a more privileged background, and I started strangely distinguishing the children of Misr Language Schools from the children of Bedaya NGO, who came from Mansheyet Nasser. All through the journey it was impossible to distinguish these from those. All the children looked the same and performed with the same foundation of self-confidence and enjoyment; although some of them had pleasant visions, while others clearly had apocalyptic predictions of the future of the city. The attitudes did not create any barriers; they all had professional and futuristic, childish, imaginary performative attitudes – until the foreign language appeared as a clear tool to decide the social class and the economic level. Mariam was present all the way, even after I had submitted my speaker and left the roof. Her voice and powerful character climbed down the stairs with me, accompanying me in my new vision of downtown. A vision that will be forever stamped by a positive futuristic perspective, re-bonding the spectators with their own powerful childhood while opening a positive channel of hope for a city on the verge of death.